These paper mache china poblana dancers and charro cowboy skeleton figures are the perfect addition to your Dia de los Muertos display. 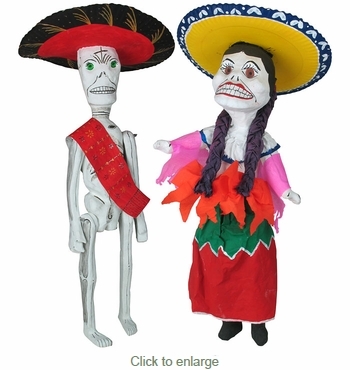 All of our paper mache skeletons are handcrafted by folk artists in Mexico for authentic Day of the Dead decor. China: 25" x 5" • Charro: 31" x 5"